The ability to create additional notes to help get you through the presentation. These accompany each slide and can contain additional text or comments. Each notes page contains a small image of the slide plus any notes. You can print and use them to prompt you during a presentation. Every slide in a PowerPoint presentation has an accompanying speaker notes page which consists of a smaller version of the slide along with space for any notes you might want to add. If you want to add information to your notes page or change the size of the placeholders you can do so using the Notes Master. When you give an important presentation to a large number of people this provides you with a way to write the complete script beforehand which you can then refer to during the actual presentation. The Notes pages can also be used to write down any jokes or anecdotes etc that you want to remember during the presentation. You can print blank notes pages if you would rather handwrite your notes. 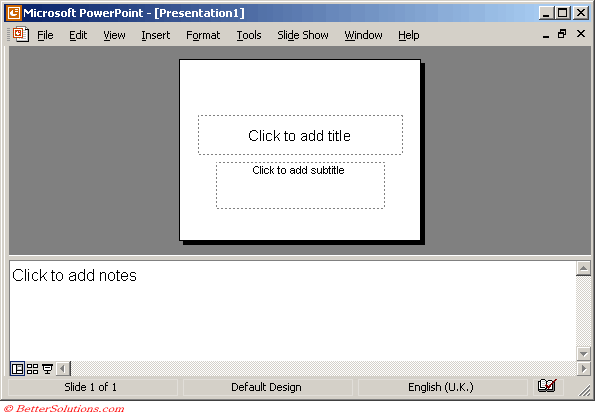 You can use (File > Print) to print blank notes pages for your presentation. You can also create audience handouts which contain either two, three or six slides on a page. In the Normal view the notes are displayed at the bottom in a separate pane. You can adjust the size of the Notes pane by dragging the dividing bar. Each note page displays a reduced version of the slide and an area for notes. There is no keyboard shortcut for switching between the different views (or panes ??). 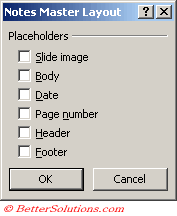 You cannot modify any objects on a slide from within Notes Page view.